Dr. Raghu Kalluri, M.D., Ph.D.
Raghu Kalluri is chairman and professor of the Department of Cancer Biology and the director of the Metastasis Research Center at the University of Texas MD Anderson Cancer Center, where he also holds the Rebecca and Joseph Brown Endowed Chair. 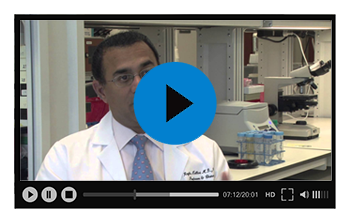 CPRIT funding helped bring Dr. Kalluri to Texas from Harvard Medical School in 2012. In 2015, Kalluri’s lab at MD Anderson received widespread attention for a discovery that could lead to a blood test that detects pancreatic cancer at an early stage, before it spreads to other organs and becomes too difficult to treat. The study, which was published in the science journal Nature, shows that a protein present on cancer exosomes was found in the blood of pancreatic cancer patients, but not in the blood of those who don’t have the disease or who have chronic pancreatitis.